The human-like Birds have their own planet and until recently they have lived in peace and harmony. Unfortunately, their world was attacked by Monsters from outer space, and there are three Hero Birds that can destroy their enemies, but they will need your help. 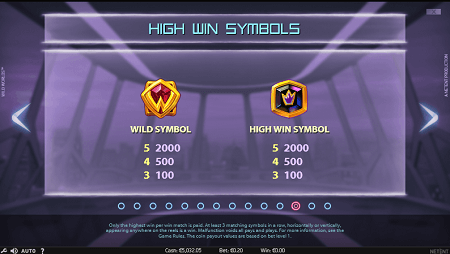 Wild Worlds is NetEnt’s latest release, a five-reel video slot that benefits from cluster pays and offers exciting and rewarding additional features. Create winning clusters with Hero Birds to activate Hero Wilds. Benefit from the Destroy feature and trigger the Free Spins feature, which offers three different Free Spins Worlds – Ice World, Fire Lands and Dark Forest. Three Hero Birds are ordinary Birds when their world is safe, but they turn into superheroes once the danger is near. The Blue Bird, the Green Bird and the Pink Bird are among high-paying symbols. There is also the Crown and the Hero Wild, which substitutes for all regular symbols and pays the most. Remember that the Wild is created when matching Hero Birds symbols create winning clusters. Three corresponding Gemstones are used as low-value icons. 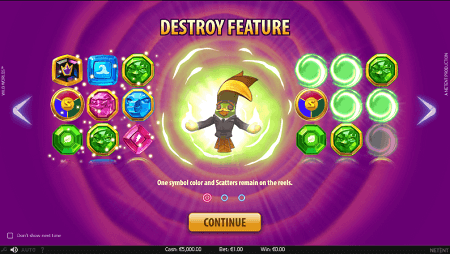 The Scatter is used to trigger the Free Spins feature. Also, there will be different Monsters appearing during freebies. The 2019 release features five reels, three rows and benefits from cluster pays. Land three or more matching symbols horizontally or vertically to create a winning cluster. The winning symbols will disappear and new symbols will fall on the reels, thanks to the Avalanche feature. Create winning combinations with Hero Birds symbols and all instances of Hero Birds on the reels will turn into Hero Wilds. The NetEnt product offer a pretty wide betting range, because betting starts at £0.20 per spin and the biggest possible wager is £400. Set the coin value and the bet level before you start spinning the reels. There is the Destroy feature, triggered randomly after a non-winning spin. Once activated, the Destroy feature will leave on the reels only symbols of one particular color, while all other symbols will be destroyed. Land three or more Scatters to trigger the Free Spins feature. There are three different Wild Worlds on the offer and you will have to spin the Wheel in order to determine which of the Worlds you will visit – Ice World, Fire Lands or Dark Forest. In all of them you will get 8 free spins and in all of them you will have to destroy Monster Captains to Reach the Boss. If there is any freebies left, you can also destroy the Boss to retrigger the feature. Any win will result in an attack on the Monsters. A win of a particular color will grant one hit to one of the Hero Birds. For example, wins with Pink symbols will give the Pink Bird one hit and start filling the meter. If you create a winning cluster with Hero Birds symbols, the meter of the corresponding Hero Bird will be filled immediately. Each Bird has one special power that is represented when the meter is charged. Once the Monster Captain or the Boss are destroyed, gamers will get certain benefits, which depend on the Wild World you are currently in. In Ice World, you get Heavy Wilds, a stack of 2 Wilds placed randomly on the reels to help you create new winning clusters. Wilds remain on the reels for another spin. In Dark Forest, gamers get Spreading Wilds, which, if part of a winning cluster, explode and add new Spreading Wilds on the reels. Finally, Fire Lands offer Random Wilds. From 2 to 4 Random Wilds are added on the reels and if they are a part of a winning cluster, they will explode, but new Wilds will appear on their place. If they are not a part of a winning cluster, they will remain on the reels. All Wilds are activated when the Monsters are destroyed. Also, destroying Monster Captains and the Boss will get you additional free spins in different worlds. The Wild is the symbol that pays the most, offering 2,000 coins for five of a kind. The Crown will also get you 2,000 coins for the biggest winning cluster. The Free Spins feature is where you should look for massive wins, especially if you manage to destroy Monster Captains and the Boss, because Wilds will be added, as well as extra freebies. Wild Worlds’ RTP is 96.47%. Despite the fact that the NetEnt product is more a video game than a slot, and that it is pretty detailed, it is playable across all devices, no matter how small the screen is. The gaming experience is completely the same on desktops, laptops, mobile phones, tablets, and other compatible handheld gadgets. It is not a secret that we are action junkies and that we simply adore video slots that are similar to video games. We love how NetEnt managed to combine slots and arcades in one product and we had plenty of fun destroying monsters, visiting different Wild Worlds, winning plenty of cash. However, not everyone will enjoy the 2019 release as much as we did. We will definitely advise every single gamer to try out Wild Worlds, because, apart from offering excellent gaming experience, the NetEnt product will also allow you to win big. 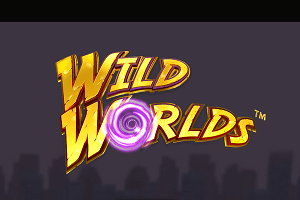 Play Wild Worlds slot at Genesis Casino!